RIRA Public Purpose Committee To Review Recommended Allocations Of Public Purpose Grant At April 7 Meeting. I received the following message from the Roosevelt Island Residents Association (RIRA) Communications Committee Chair regarding the scheduling of a meeting by the Public Purpose Funds Committee to review the allocations in Public Purpose Funds previously made. The subcommittee will include those RIRA Common Council members who volunteered AND only those who have no conflicting relationship (officer, director, employee, ownership) with the PPG applicants. The seating arrangement will be like RIRA meetings (tables in the center, observers on the side) so it is clear who is part of the committee. RIRA President, Frank Farance, will chair the subcommittee. The meeting will be videotaped. This is an open meeting and the public is welcome to observe. Assuming we reach agreement on Tuesday night, RIRA will do an E-mail ballot of the revised allocations. With this, RIOC will have either a revised allocation, or if no changes are deemed necessary, will issue a statement that the original allocation was not the result of any conflict of interest. It is RIRAs intention that this will yield a process that is free from any appearances of conflict or unfairness. c) Frequency of need – Is this a one-time request or is it expected to recur ? are filled by donated time or materials ? chances of receiving additional monies or services form outside groups? UPDATE - 4/8 - The Public Purpose Funds Subcommittee met last night and reaffirmed their previous allocation of funds. Members of the various Island organizations seeking funds were in the audience but their participation was limited to presenting new information not previously known or correcting false information. 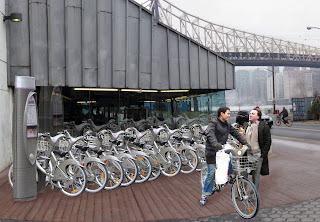 Access RI - Bike Sharing For Roosevelt Island? 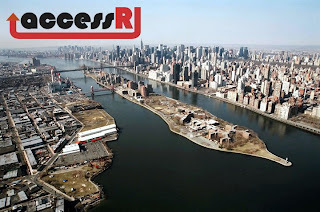 Access RI Holding Community Review Of Proposals To Improve Roosevelt Island On Saturday Morning 10 A.M.
Tuesday, March 31 from 7-9:00pm and Saturday, April 4 from 10:00am- 12 noon at the Senior Center, AccessRI will be holding a community review of the accessibility plan underway. Open to all! The Senior Center is at 546 Main Street. You can still take the Roosevelt Island Community Survey and review the Comments Map. ... Finally, F train riders have something to celebrate. Unfortunately these new F train subway cars will not be making Queens Bound stops at Roosevelt Island this weekend. The MTA is reporting no Queens Bound F Train subway service to Roosevelt Island this weekend. 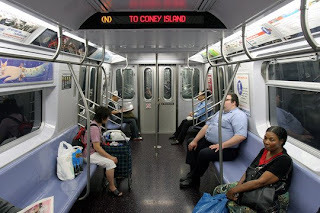 The F Train will be running on the E track so in order to get to Roosevelt Island from Brooklyn or Manhattan by subway take the F to Roosevelt Avenue and then take the Coney Island bound F Train back to Roosevelt Island. For service to Queens from Roosevelt Island, the MTA suggests taking the Q102 Bus to Queens Plaza for the E and the R train or the F from Roosevelt Island to West 4 and then the uptown F train running on the E line. Happily RIOC is not reporting any Tram service advisories for the weekend but expect the Roosevelt Island bound Tram to be more crowded due to the F train service disruptions. Later Saturday night check out the 100 Hours of Astronomy Project with the Columbia University Astronomy Outreach team. The 100 Hours of Astronomy project is a star party taking place April 2nd-5th on sidewalks all across the globe. Our outreach team will be manning telescopes at 125th and Adam Clayton Powell Blvd in Harlem on the clear-weather nights of Thursday, Saturday and Sunday (NOT FRIDAY). We will provide everyone with free looks at Saturn and the Moon, as well as astronomy swag. There is also rumor that the AMNH portable museum will show up for hands-on astronomy activities. Ultimate Roller Coaster is reporting that Sunday will be opening day for the Coney Island Cyclone. Coney Island's world-famous Cyclone roller coaster will kick off its 2009 season Sunday, April 5. The first 100 people in line on Sunday will be treated to a free ride on the roller coaster. Did you miss the chance to enjoy Coney Island in it's heyday? Perhaps even its recent nostalgic yet run down Renaissance? Well don't fear. While Brooklyn's little playground by the sea is undergoing a Disnification, you can still learn all about its grand and sorted past at the new Coney Island History Project Exhibition Center. Each weekend throughout the summer, they will spin yarns of yesteryear under the rickety old Cyclone for you wax poetically about. Today is their kickoff event with a photo exhibition and free Cyclone rides to the first 100. All ages. the Farmers Market will be open as usual on Saturday as is Gallery RIVAA, the Roosevelt Island Visual Arts Association which is exhibiting a group show titled Vernissage 8. Also, RIOC has produced a great self guided tour map (PDF File) of Roosevelt Island for any visitor or resident looking to stroll the Island and learn something more about it. Not so good weekend transportation news. The MTA is reporting no Queens Bound F Train subway service to Roosevelt Island this weekend. The F Train will be running on the E track so in order to get to Roosevelt Island from Brooklyn or Manhattan by subway take the F to Roosevelt Avenue and then take the Coney Island bound F Train back to Roosevelt Island. RIOC is not reporting any Tram service advisories for the weekend. Check out some other ideas on what to do in New York City this weekend from the NY Times Urban Eye and Spare Times, the NY Post Weekend Calendar and Newyorkology. 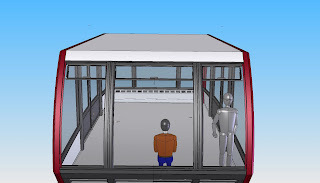 Roosevelt Island Tram Cabin Design Possibilities - Will Robots Be Operating The Tram? 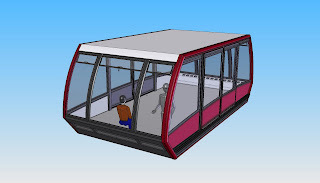 SIGMA has been working last week to design the cabin in accordance to our last meeting in RIOC two weeks ago. Here attached you will find a set of images that we would like to present to you in order to get your approval in terms of aspect (taking apart any technical point). 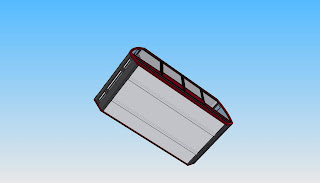 This is necessary to avoid a loss of time and to make sure that we are in the good directions before going further in the design procedure. 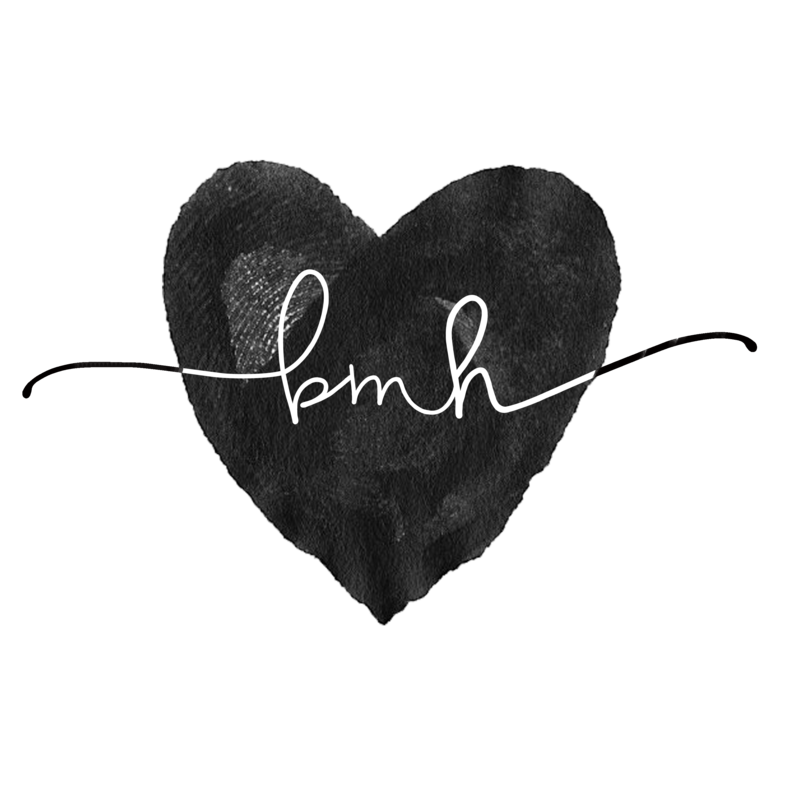 I would appreciate if you come back to us as soon as possible. 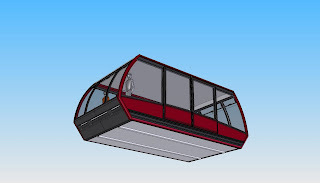 Mr. Shane sends the following to his Tram Cabin Focus Group. My instant focus group. If I've left anyone out, I apologize in advance. Please feel free to inquire of your circle and get back to me with comments by COB tomorrow, April 2 so I can respond to the design team. Obviously, need poles to hang onto, cabin console, some provision for anchoring a wheelchair, roof hatch, signage, etc. 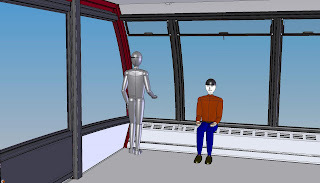 Other than the robot, who I am pretty sure will not be operating the Tram, what do you think of the designs? What were these four RIOC Directors (not the guy in the shorts) talking about yesterday afternoon prior to the Governance Committee meeting on Roosevelt Island Public Purpose Funding? I have no way of knowing but I think they were trying to decide on whether to go to Trellis, Starbucks, Nonnos or Fuji East after the meeting. The Web Cast of yesterday's Governance Committe meeting will be available shortly. No decision was made by the RIOC Directors yesterday regarding the allocation of Public Purpose Funds. The Directors were primarily seeking to determine if the process RIRA used to allocate the funds among competing Roosevelt Island groups was not only fair but had the appearance of fairness as well. 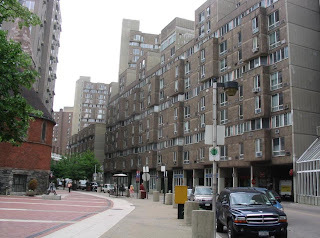 The Roosevelt Island Residents Association (RIRA) Common Council will be meeting tonight Wednesday, April 1, 8PM at the Good Shepherd Community Center (543 Main Street). Prior to the meeting, time is alloted for any resident to speak before the Council and air their views or issues of concern to Roosevelt Islanders. - Status report on RIOC long-term budgeting. Here is the Report of the RIRA Planning Committee. 1. Katz discussed the ongoing efforts by the two graduate classes at Columbia University and Hunter College to address Island issues, especially transportation. He reminded the committee of the two dates scheduled by the Hunter group to present their data: March 31 and April 4. 2. 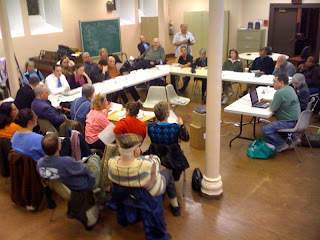 Community Board 8 Member, Ellen Polivy, discussed the work of their Parks Committee to plan a Citywide forum in May on the appropriate commercial use of parks. 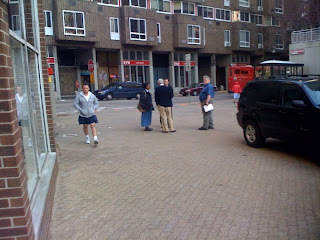 CB8 has banned vendors from Tram Plaza, and Mincheff noted that their presence would act as a deterrent to vagrants as well as helping to maintain the site and provide refreshments to the Islanders who are primary users of the Tram. The Committee agreed to draft a resolution (under separate cover) to CB8 asking them to reconsider and to present it at the April 1 Common Council for their approval. The Committee agreed to draft another resolution (under separate cover) to RIOC encouraging them to provide refreshment services, either directly or through outside vendors, at our parks. 3. Farance noted that RIOC President Shane appears to have reversed his endorsement of a master leaseholder for the Northtown Main Street retail stores. The RIOC Real Estate Advisory Committee, chaired by Charlee Miller, is still supporting the plan, although they have yet to make recommendations to the Board. Kalkin said that RIOC VP, Rosina Abramson, has called for a study of the master lease proposal, as opposed to having RIOC or a hired consultant, fill the empty stores. Kalkin said he is investigating banks and credit unions that might take over the NYNB space when they leave in June. Mincheff noted how important a banking presence on the Island is, especially for seniors. 4. Farance, who proposed and convened a sub-committee of this Committee to investigate RIOC’s inadequate budget projections, reported that CFO Chironis has reneged on his guarantee to provide complete financial data. He was promised a database dump from 1991 that would include line-item actuals, and this has not been forthcoming. 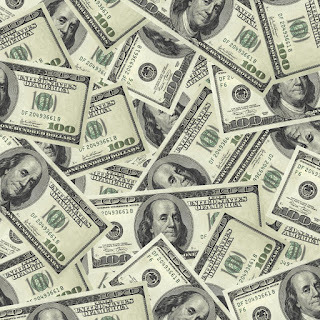 Farance noted in The WIRE RIRA column that RIOC’s five-year revenue projections don’t offer satisfactory assurances of solvency in the current economic atmosphere, especially with future Southtown ground lease revenues put on (what we can only hope will be) temporary hold. Farance has posited three scenarios for the future development of the Island, each of which results in RIOC’s insolvency sometime in the middle or distant future. Accurate data from RIOC could corroborate or refute these analyses and aid both RIRA and RIOC to plot a future course of fiscal action. Farance is pursuing various avenues, including Board members and local legislators, to acquire this information. Kalkin said he would try to get the data. The set-up of the website is still underway. As stated in the prior report, with only two members, this chair will be communicating with the committee via email as necessary, rather than holding formal meetings. 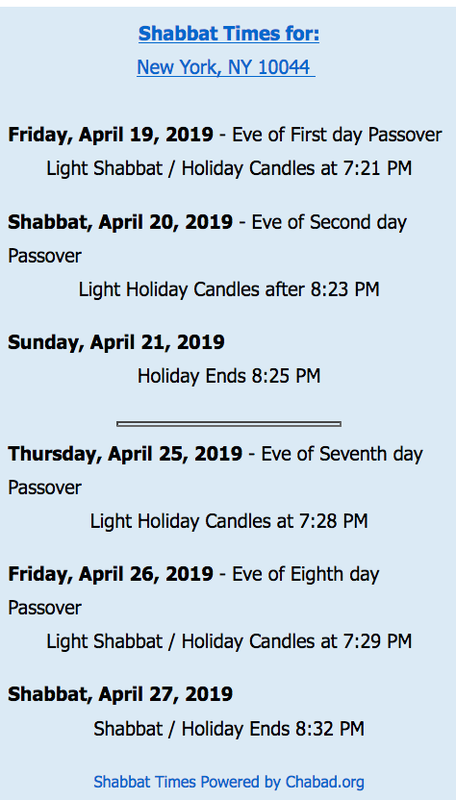 I have communicated with the Roosevelt Island Blogger who has generously agreed to post the agenda and the meeting materials on that site so that this information is accessible to the public. As stated previously, I hope to eventually post the pictures of the Common Council members on the website as many tenants recognize faces rather than names and may improve communication between representatives and the tenants. Pictures will be taken during the April meeting. We have learned that in the last 6 months, there have been 35 cases of credit card theft on Roosevelt Island. These incidents are now under active investigations by the Post Office, the NYPD and the Secret Service. Since these cases are being pursued by the proper agencies, ISC will no longer be active on this issue. However, we will continue to closely monitor developments. Red Bus morning rush hour service problems seem to have been relieved. However, at least one problem remains. From time-to-time, the local Red Bus will not pick-up passengers at the Good Shepherd and Island House bus stops due to overcrowding on the bus. ISC will monitor the situation to determine how frequently the by-passing occurs. We will be asking residents at these bus stops to report to us on all incidents. Notices will be posted on appropriate Main St. kiosks requesting the information – date and time of each missed bus pick-up during the weekday period of 7 am – 9 am. In March, the MTA finally installed a ramp in the middle of both Roosevelt Island station platforms that will allow wheelchair and motorized carts to easily board the F train. This successfully close out the ISC ‘s interest in this important issue. Committee members and RI residents report that our branch library is not providing a variety of services expected from Manhattan libraries. Some examples: the RI library is not scheduling children’s reading groups, not cataloging and properly shelving the special collection of documents, reports and books relating to RI history, and not out-reaching to the community, especially to our schools. ISC will gather additional information and then consider taking our concerns to the higher management of Manhattan libraries. Many bikes seem to be permanently stored at the subway station racks. This prevents residents from using the the racks for their intended purpose – temporary storage of a bike while a resident is using the subway or tram to travel to another part of the City. We are contacting the Public Safety Department to see if they can control the bike storage situation. And a proposed RIRA resolution to Community Planning Board 8 regarding lifting a ban on licensed vendors at the Manhattan Tram Plaza. 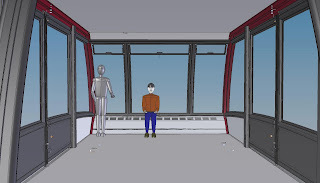 Therefore, the Roosevelt Island Residents Association, representing 12,000 residents of our community, respectfully requests that Manhattan Community Board 8 reconsider its ban on the presence of licensed vendors in Tram Plaza. Trophy Name Suggestions For Roosevelt Island Soccer League At Firefighter's Field Being Sought - Any Ideas? Right now we're applying for a permit to play a Soccer League in the firefighters field during the summer. 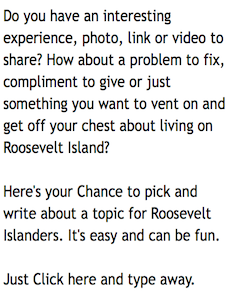 We would love to honor a Roosevelt Islander, by naming our trophy after him or her. But I was wondering if you can give me some suggestions. Now, if only the cab drivers believed that Roosevelt Island is part of Manhattan it would be much easier getting them to take fares here. 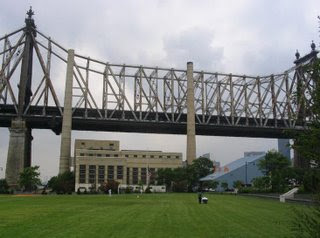 More on Roosevelt Island and other New York City Main Streets here. Roosevelt Island 360 also noticed the Metropolitan Diary letter. Last autumn New Yorkers 4 Parks donated 600 daffodil bulbs to the Roosevelt Island Historical Society. We gave them to island groups and management companies to plant. Please take photos of our daffs in bloom and submit as below with a copy of your photos to this email address. We would love for an islander to win. AccessRI will be presenting a draft of our accessibility study for community review. We invite you to participate in this discussion about our recommendations for the island. As always we look forward to your questions and comments! What are some of the issues addressed in the Access RI study? Take a look at the Comment Map prepared at their community Open House last December. If you have not yet taken the Roosevelt Island Community Survey, please take a few minutes to do so. The Columbia University Urban Planning students should be presenting their study soon as well. It looks like Roosevelt Island is becoming a laboratory for future urban planners.